Rental growth rates are expected to be quite strong in the near-term forecast. For example, REIS is predicting that rent growth will be between 3.6% and 3.8% for 4 of the next 5 years. Axiometrics, an apartment research firm, is forecasting REIT effective rental growth rates to be above 5% in both 2012 and 2013. They also expect the vacancy rate to be near 3.5% in 2013. Further, we have also found empirically a possible relationship between rising interest rates and apartment rent growth, suggesting that strong rent growth is more likely with increases in Treasury Rates. In REIS data, the correlation is over 50% and in our own historic data it is higher. 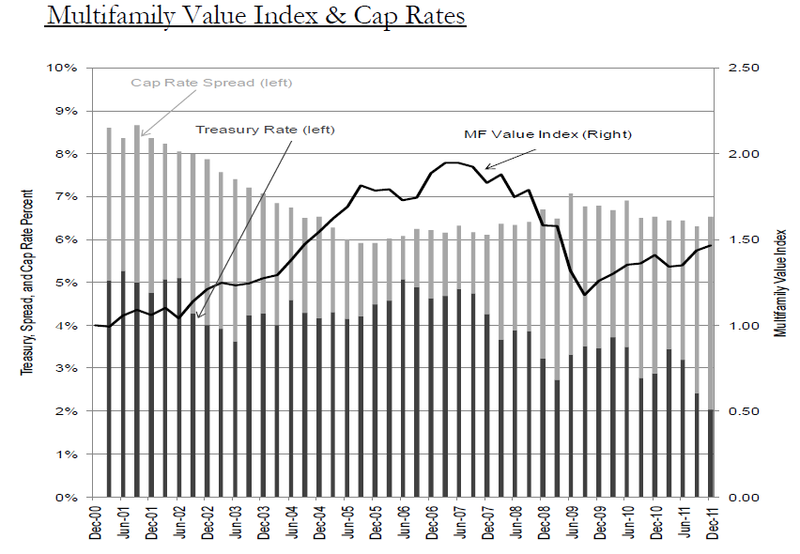 Hence, we feel confident that multifamily property valuation will maintain a healthy level at maturity. there always a minor or major fluctution in real estate market and within 5 years the picture is totally changed as wherever you concern.